Laura and I had a taste of what our teachers experience on a weekly basis traveling out to the remote villages and towns to offer classes to seventh, eight, and ninth graders. We normally wouldn’t have that opportunity as, with the teachers gone, we’ve been staffing the office on those days. But the State Department of Education has mandated that we have photos on file of all our students. We went out on Tuesday and Wednesday as official photographers of Maestro en Casa. Tuesday’s journey brought us to Jesús de Otoro, a relatively large town just off the main highway that, like La Esperanza, serves as a commercial center in support of the smaller aldeas in the surrounding hills. It only took us about an hour in the car. It would be a little less for the teachers, who would generally travel by motorcycle. It was a pleasant trip and we had the fortune of meeting more of our students. Memorial Cross on the way up to San Isidro. Wednesday’s trip was something altogether different. San Isidro is an extremely small, poor, and isolated village. 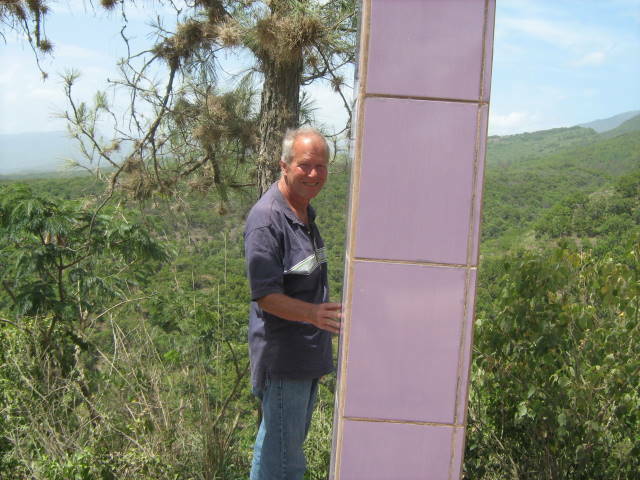 To get there, we had to come all the way down the mountain from La Esperanza into the valley of Otoro. Then, we went back up again, probably two-thirds of the way, along an unpaved, rutted and washed out road. We traveled a good two hours (again less time on a motorcycle) into the wilderness, treacherous inclines and declines, at an average of about ten to twelve miles an hour. The few people that live there, do so in order to harvest the coffee. You can’t make much of a living harvesting coffee, and the people basically live off of the beans and corn they grow, completely cut off from the rest of the world. It was an absolutely breathtaking experience and one I doubt we’ll ever have again unless I can get Laura on the back of a motorcycle. Not likely. The four wheel drive vehicle we were in is old, held together by prayer and duct tape, and we would seldom take it on such a trip. As most vehicles in Honduras, it was reconditioned from an automatic to a standard transmission. Sitting in the front sit, I could feel tremendous heat coming from the stick shift as it struggled up the steep rises. 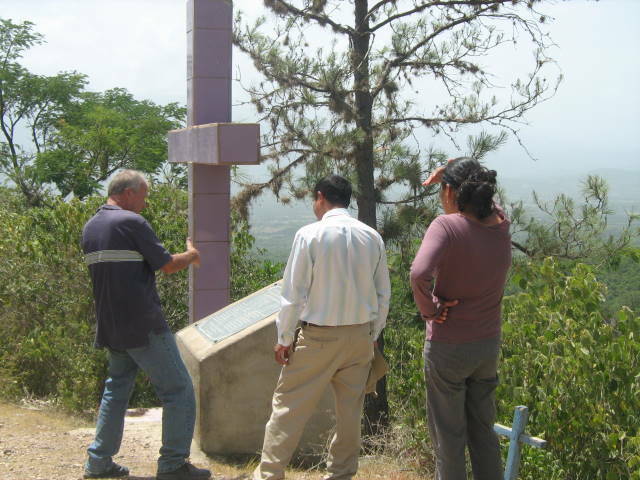 On the way back we stopped briefly at the site of a memorial cross marking the spot where a bus with twenty plus people lost its brakes and plummeted down four to five hundred meters into a canyon. As we started back out, our driver, Arturo, stopped immediately, pumping the brakes vigorously. The heat from the transmission had thinned out the viscosity of the brake fluid, almost causing the brakes to fail. After a few minutes, the pressure returned, and we drove on without further difficulty. I did, however, wonder whether there would be room on the memorial plaque to add our names. More than anything else, the two days of travel gave Laura and I a deep appreciation for the commitment of our teachers. They don’t get paid a lot. At least three of them do not have electricity in their home, and, like many Hondurans, at least one has a home with a dirt floor. It is clear that they work at Maestro en Casa because they need jobs. But, it is equally clear that they fervently believe in the value of what they do. As so often is the case in the thankless job of education, here and in the States, they do what they do because they have hope in their students. Money is very tight right now. I’m told that this is not an uncommon event for Maestro en Casa at this time of the year. The school year will go to November. At that time we’ll have an influx of registration and an infusion, albeit modest, of income from tuition. As we are yet a ways off from November, we’ll knock on wood and rely on the kindness of supporters and foundations. Hopefully, we’ll squeeze by as I’m told we have in the past. But, we are living from hand to mouth, a very sobering feeling. I jokingly told one of our administrators here that Laura and I would be happy to give up our salary. It’s easy to be generous when the donation is zero. 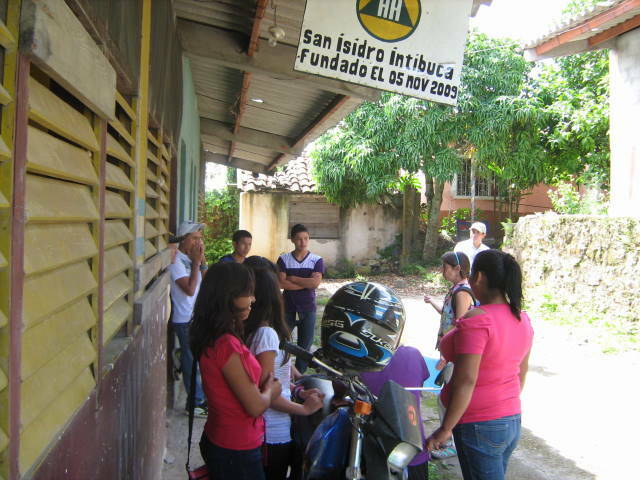 Laura with students outside classroom in San Isidro. Almost four-hundred students, and our yearly budget is about $40,000. You can do the math, but even in Honduras, the per-capita cost is incredibly low. We’re a no frills education program, and the lion’s share of our income directly serves the educational needs of our students. Maybe a quarter of our operating budget comes from student’s tuition. Another half comes from a small amount of rental income, private donations, and foundational grants. That leaves us with about one-quarter, about ten-thousand dollars, that we are short. If you’ve read the website, you know that we have a greenhouse where we produce tomatoes. A second greenhouse is in the process of being built, but presently the construction is on hold as we look for funding to complete it. The hope is that the revenue the greenhouse will generate will meet that $10,000 short-fall and Maestro en Casa will become virtually self-sufficient. There is good reason to hope that this will be the case as the greenhouse, after only its first season, is beginning to produce fruit (pardon the pun). Still, we are not there yet. We continue to confront the day to day struggle of meeting expenses while holding onto the long-term vision of creating a sustainable, regular source of income. Laura has been working on applying for foundational grants, both to meet our annual budget and for the greenhouse. This is encouraging and hopeful, but the results will not be immediate. We are also reaching out into the community here to make more contacts. There are some leads that indicate we may be able to rent some of our unused space. We also might offer computer classes and/or English classes on a fee basis to interested parties in the larger community. That could help a lot, but it is very unlikely that it will completely fill the gap. The people who read this blog, our family and friends, have been incredibly generous to Laura and I personally, and to the first program we were involved with in Honduras. 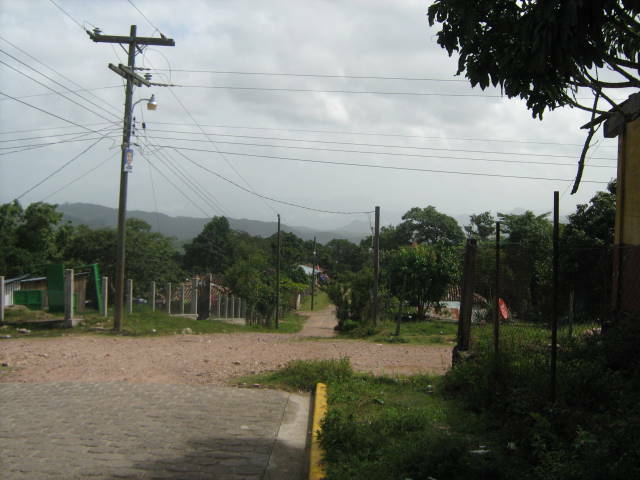 Since coming to Maestro en Casa in La Esperanza, I have not asked for any money. Given your great generosity, it didn’t seem appropriate. But necessity is always humbling. And here and now, we feel great need. Anything you can give will be of tremendous value. On line, you should go to http://lencaeducation.org/support-us/. That will bring you directly to the page that you need to be on to make a donation. If you simply go to the web site, click on the tab “support us” that appears on the top of the page on the far right. Do not choose any of the five drop down menu items on this tab as you will end up on an entirely different page. Instead simply click on the tab heading, “Support Us”, and that will bring you to the correct page. I hope you’ll see the tremendous value of your donation. My expressions of gratitude for your unselfish generosity are insufficient. I am confident that you will shame me once again. It is great work that you are doing. Just donated $25. It’s not much, but what I can afford right now.